"By 1970, the governments of the wealthy countries began to take it for granted that they had truly discovered the secret of cornucopia. Politicians of left and right alike believed that modern economic policy was able to keep economies expanding very fast -- and endlessly. That left only the congenial question of dividing up the new wealth that was being steadily generated." Those words, from a Washington Post editorial more than twenty-five years ago, echoed the beliefs not only of politicians and the press, but of mainstream economics professionals resistant to the idea that growth in a market economy would ever stagnate over a protracted period. And some of the data did fit nicely. Through several recessions and recoveries, inflation-adjusted GDP rose almost in tandem with a line of predicted growth expectations. 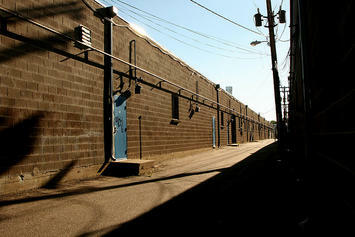 But in November 2007, something changed. Real GDP dropped down from what was expected by more than 11 percent, and, as this summer's data has shown, it hasn't returned to its pre-recession trend. The unusual slump has provoked a stream of commentary that attempts to define the problem, but it hardly matters whether the downturn is identified as the second dip of a 'double-dip' recession, a continuation of the 'Great Recession', a fast-moving slowdown, a slow nosedive, a long-term stall-out, or a confirmation that the economy has entered a Japanese-style 'lost decade'. Growth during the 21st century is following a different trend line than it did in the 20th, and employment is also responding in new, different ways from earlier post-World War II recessions. A range of additional data also indicates that what we're hearing is not the regular breathing of an economy as it contracts and expands. Annual growth rates and quarterly moving averages — when examined starting in the mid 1970s, as Greg Hannsgen and I did at the Levy Economics Institute — show a steady decline beginning in 2000. And the employment numbers make the case yet again. 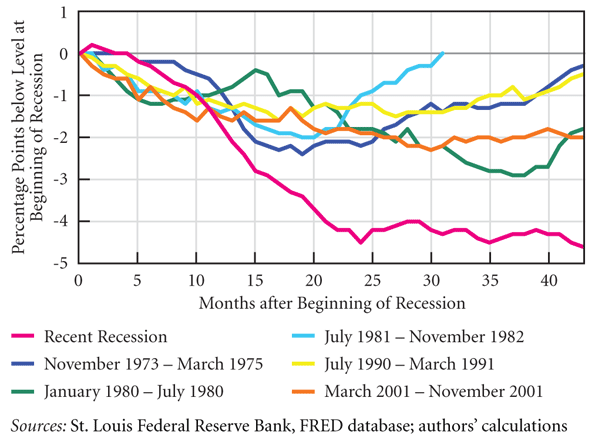 Look at the graph below, with separate lines for the past six recessions. It traces employment-to-population ratios, beginning with the first month of each recession. These ratios are used to measure, among other things, how well a nation utilizes its workforce— a kind of labor drop-out rate. You can see at a glance that the pink line indicating the current recession — yes, that one down near the bottom of the chart — is an outlier in the group. It shows that by the 43rd month of the downturn, the ratio stood at just over 58 percent, meaning that 58 percent of the population was employed. That figure is 4.6 percent less than at the recession's start, when more than 62 percent were working. And it means that this employment decline is steeper, deeper, and longer than in any of the previous five recessions by a long shot. Even in the two worst recoveries during the past forty years, this ratio never before declined by more than three percent. By the time the five recessions were this far along, employment had returned either to pre-recession levels, or to a distance from the recession's start that was, at worst, two percent, compared to the current more than four percent. Together, this data makes the case that we're in a prolonged slump that's highly unusual, and requires action that's far more aggressive than the usual responses. Job creation should be the government's urgent, first priority. The nation needs to recognize just how perilous the employment disaster is — and what a marked departure this recession is from any we've seen in the modern era. Dimitri B. Papadimitriou is president of the Levy Economics Institute of Bard College, and executive vice president and Jerome Levy Professor of Economics at Bard. Submitted by jasaseoku on Tue, 05/26/2015 - 22:11. Submitted by ymouel on Mon, 05/25/2015 - 00:25. Submitted by jasaseoku on Wed, 05/20/2015 - 18:03. Submitted by jasaseoku on Wed, 05/20/2015 - 17:55. Submitted by jasaseoku on Wed, 05/20/2015 - 17:53. Submitted by mobi on Wed, 05/20/2015 - 02:00. Submitted by VickiHuter on Wed, 05/13/2015 - 02:11. Submitted by david watson on Mon, 05/11/2015 - 01:02. Submitted by david watson on Fri, 05/08/2015 - 14:15. Submitted by johnz308 on Wed, 05/06/2015 - 14:00.